The dollhouse requires being opened up and the furniture carefully and lovingly arranged in each room to fit the make believe world of the day. Then when it’s time to pull out the trundle for the bed, or vacuum the floor or make room for another activity, the dollhouse has to be moved which means that most of the furniture has to be taken out so that the bottom can fold up and the sides fold in. So it’s a process…set it up, take it down, set it up, take it down…you get the picture! So I decided to do something about it. I decided to come up with a mobile platform to place it on and just roll it around the room as needed. 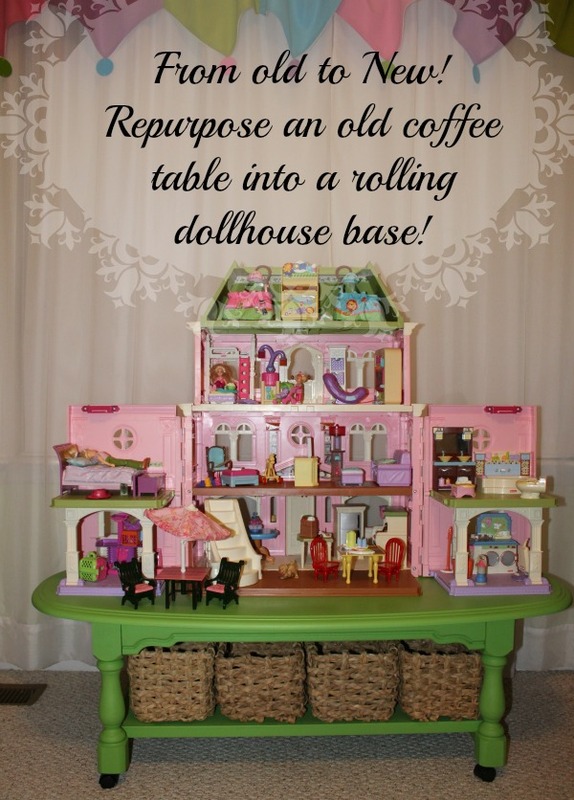 After measuring the length and width of the dollhouse when opened up, my thought was that an old coffee table should just meet the need. 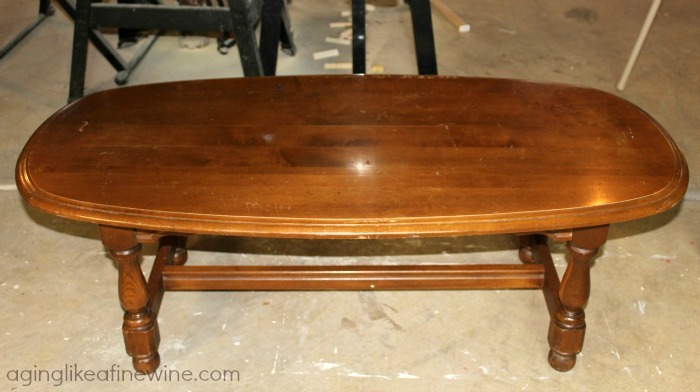 So off I went to search the local thrift stores for the perfect table! It took a few thrift stores before finding one that would work, but I finally did. The measurements were good and it was an oval shape, which I liked because sharp corners would be eliminated. Once home my husband, Paul, cut the bottom of each leg off for me and sanded them quite smooth and even. He then used his drill press to place a hole in each leg bottom for attaching the wheels after the table was painted and waxed. 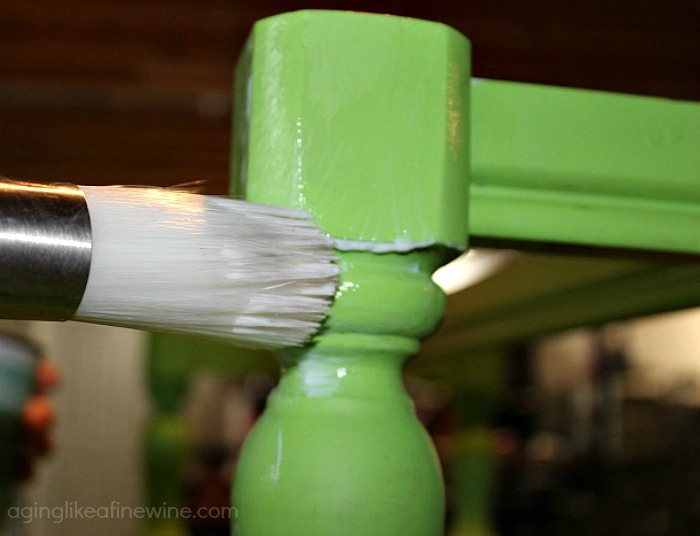 I’ve only used chalk paint once before and that was on a very small project. I’ve heard and read so many positive things about its ease of use so I decided to try it for this larger project. All of my reading pointed to Annie Sloan chalk paint being the chalk paint of choice, however for this project I chose a slightly cheaper Velspar brand chalk paint. My granddaughter had already requested that the table be green to look like grass, so of course that’s the color I purchased. I also chose to forego the antique look of using the dark wax and purchased only the clear. 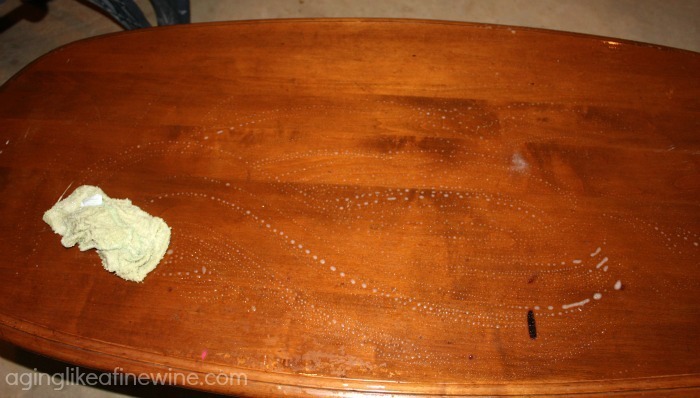 My first step with the table was to wash it with a mild soap and water, rinse it and allow it to dry over night. The following morning I painted the bottom, legs and support bars with the first coat of chalk paint. The first coat did not provide full coverage, but I knew from things I’ve read that this is normal. 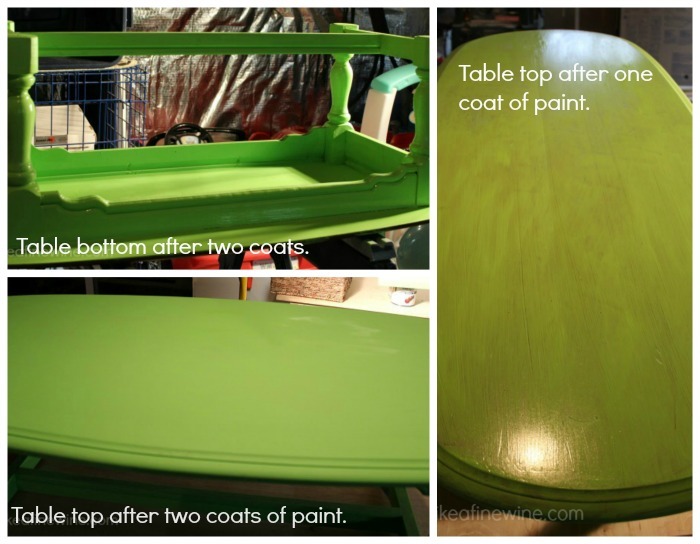 I allowed the table to dry throughout the day and applied the second coat to those areas that evening. Working in small sections, I applied the wax by dabbing the end of my brush into the wax and then dabbing the wax onto the wood, making sure to get it into the crevices. 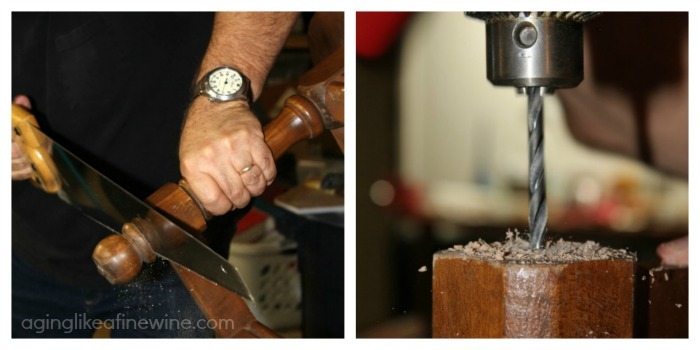 I then finished in that same small section with a long stroke that ran with the grain of the wood. I then waited 1-2 minutes and wiped off the excess using one of my husbands old white t-shirts. Then moved on to applying the wax in the next section. I applied a second coat of wax to the bottom and sides of the table. Then I moved on to the top of the table. I applied 3 coats of paint to the table top to get the coverage I wanted, waiting in between each coat for the paint to dry well. I then applied a coat of wax to the table top, waited overnight and applied a second coat. I decided I would like to have a shelf attached to the support bars on the bottom of the table. Then baskets could be placed on the shelf and used for storage for dollhouse accessories. 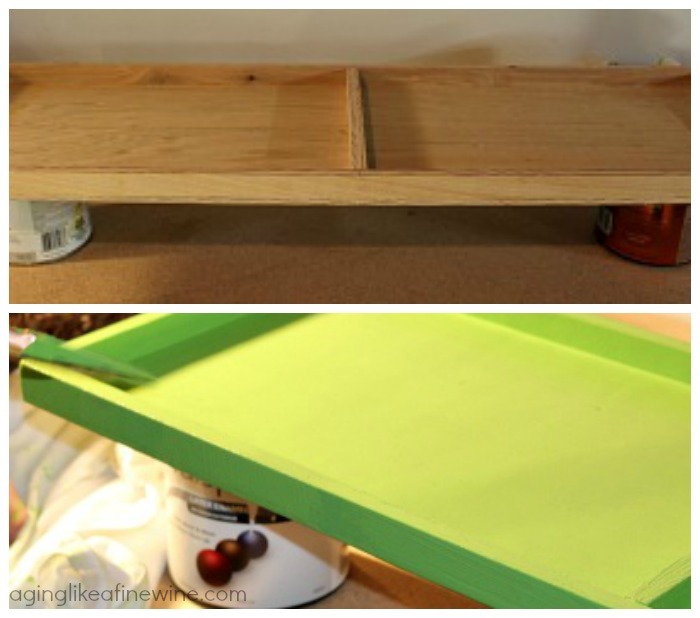 Paul built the shelf, I painted and waxed it and when finished he secured it to the bars with small screws. I then went searching for the right size baskets. This turned out to be much harder than I had anticipated!! The basket selection at every store I checked, was not up to their normal standards. This was discouraging, but I finally settled on baskets that would fit and could be used, though not what I originally had in mind. I really didn’t know what to expect when I started this project, but I have to say I’m a little disappointed in the result. I don’t know if it was just my technique, my lack of knowledge of chalk paint or if the paint and wax I chose just didn’t work as well. 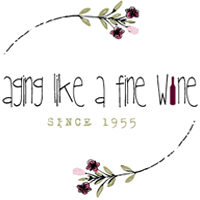 Before my next project I intend to watch some chalk paint videos from trusted websites to gain more knowledge and invest in Annie Sloan paint, wax and brushes to test the difference. We have a full basement with half of it finished for living space and the other half used for storage and a workshop. I learned quickly that I need better lighting in my work area. I couldn’t see well enough when I was applying the paint and when I went back to start the wax, I saw areas where the paint had run some. Plan is already in the works to enhance the lighting! Overall, I am really happy to have this table! 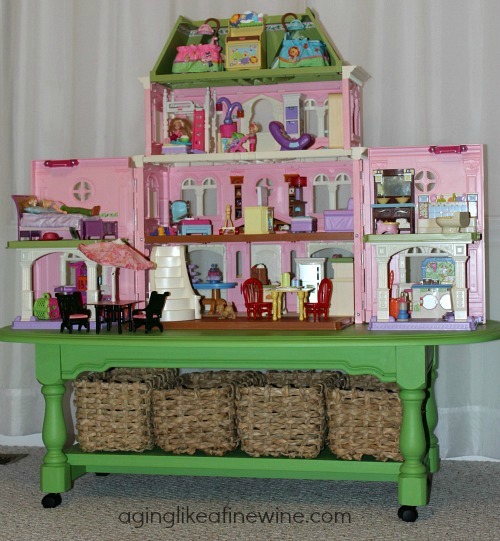 It was so nice to be able to place the dollhouse on the table, open it, organize the rooms and then be able to move it easily around the bedroom without disturbing the furniture. I hope that this is an idea that has been beneficial to you and provided you with an option for gaining control over a pesky, messy toy that lurks at your house as well!